caramia made: Full Steam Ahead! 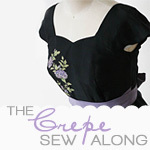 So far 2011 seems to be rather productive on the sewing / DIY side of things... Probably this stems from the fact that I only work part-time AND don't have cable AND it is cold and snowy outside... Which leaves plenty of time for indoor sewing and crafty projects. Being that I'm now in my late 20's, most of my friends have / are having children. I was invited to a baby shower for a friend this past Saturday. They found out they are having a girl (yay!) and I was so excited to bust out my stash of vintage baby patterns. I decided to make a sweet little dress (size 1) from the Simplicity 3803 pattern from what appears to be the 1950s or 1960s (no date on the envelope). I used a printed seersucker fabric that was from my nana-in-law's stash, and added some red rick-rack and red grosgrain ribbon for interest. Can you believe there is 2m of fabric in that skirt?!?!?! No wonder it's so voluminous, lol! It is my husband's birthday this week, and I've been wanting to sew something for him for awhile. He is sooo picky and doesn't like anything remotely "fancy", but this past holiday season made it painfully obvious that he has no formal clothes. He has one pair of dress pants that don't have pleats on the front, one shirt (that I bought him! ), and maybe 3 ties... one of them being the tie he wore for our wedding. We have 4 (!!!) weddings to go to already for 2011, so he is in desperate need of help. I bought the Burda 7767 pattern and plan to make him Version A in a grey cotton-linen blend. I love the pintucks on it, and it will be a casual dress shirt, but still a dress shirt nonetheless. Two of the weddings this summer are beach weddings and will be extremely casual. So this shirt will be just the ticket! I would also love to make him some casual, but not denim, shorts to wear for work and said beach weddings this summer too. I've been eyeing up the Jochen pattern from Burdastyle, but haven't purchased it yet. Have any of you used it? Would I be better off to buy something else? It seems that Burda really is the only pattern company that makes anything half decent for men... Why is that? Men deserve to look good too! Peter over at Male Pattern Boldness is doing a men's shirt sew-along for February which I am going to try and follow. I'm not sure if I will make the Negroni shirt from Colette patterns or not, but I have a few vintage men's patterns kicking around in addition to the Burda 7767 so I might just make N something from one of those patterns. I've got a few more things cut out, and will be working flat out for N's birthday shirt tomorrow. Wish me luck!